The permanent Clinton Street diverter at 32nd has been completed. This marks the conclusion of over a year of effort by BikeLoudPDX, planning by the city, and feedback from the community. 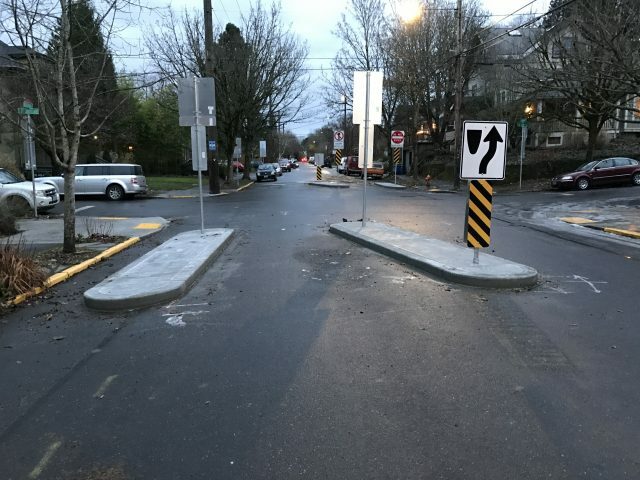 The diverter is a new design for Portland, featuring two concrete pads that widen as one rides through that prevents cars from getting through, but is wide enough for a large cargo bike. Because of the nature of the diverter that allows for both right and left turns (but no straight movements) by drivers, it is unfortunately still possible to cheat the diverter by driving in the oncoming lane. There has already been feedback from the community about the sterile appearance of the diverter, and consensus is growing that the diverter could use some “beautification”. Planters, flowers, and paint have all been suggested as ways to improve the look of the concrete pads. Officials from the city seem receptive to this idea, on the condition that it does not impede emergency access. Community members will continue to work with the city on this and hopefully will come up with a design that improves the attractiveness of the diverter. I rode through the diverter this morning and it functions much better than the old temporary diverter that was fashioned from gravel-filled garbage bins. The opening is much wider and requires little to no weaving. On my 50 lb. Dutch bike, I had no problem navigating around the concrete pads, whereas with the old design I would often find myself riding in the oncoming lane. Illegal parking was a major issue with the temporary design – there was often a large boat that was parked very close to the opening, making the already tight turn even more tricky. The permanent design addresses this issue by moving the opening further toward the middle of the street. Even if someone was parked right up to the concrete pad, they would not be interfering with bicycle traffic. Overall, it’s a good design that allows bicycles of all sizes to safely navigate though the diverter. The only issue seems to be about its appearance, and hopefully that can be addressed with a community effort. It’s been a long and bumpy road, but we finally have a safer Clinton Street. 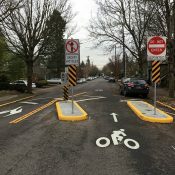 Thanks to PBOT, BikeLoudPDX, the Richmond Neighborhood Association, and everyone else who helped get this on the ground. That photo does not include the permanent striping – a weather related delay, most likely. Ah, thanks. I didn’t notice the striping was not yet put in. It’s still too cold to lay thermoplastic, so I’m assume it will just be paint? Also, it was not part of the original render, but it might be a good idea to place another DO NOT ENTER sign on the left side facing the oncoming lane. That would make it blatantly clear that people should not be driving around the diverter. Speed bumps west of 26th will be constructed in the spring. Why? BikeLoudPDX came out against them. Hosford-Abernethy Neighborhood District came out against them. They go against PBOT’s own policies about when they’re appropriate. Why does PBOT continue to insist on constructing something the stakeholders don’t want and feel will be ineffective? Richmond NA (where these are) was supportive. PBOT said they received overwhwelmingly positive direct feedback from neighbors when these were proposed. I live on Clinton a few blocks from these and I can attest to how awesome they are. I think they were referring to speed bumps west of 26th (in HAND, not Richmond). I agree that the diverters are awesome. I hope for many more of them. some needed context: the area west of 26th has motorvehicle traffic volumes that are too high for the area to be re-signed to a 25 mph speed limit. instead of installing infrastructure specifically designed to reduce traffic volume near 26th, PBOT is *hoping* that a tool designed for speed reduction will discourage driving. 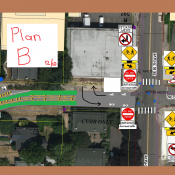 it’s unclear if pbot will revisit this decision if the extra speed bumps don’t work. and they’re experimental bike friendly bumps. What about the experimental design makes them bike-friendly? Not a fan for this reason. Some drivers will undoubtedly drive right through it. I rode through the old diverter twice a day and saw only one or two people that chose to drive around it. I’m not convinced it will be a huge issue. I honestly saw more issues at the 17th Av diverter – far more people drove around the block, then back to Clinton Street to avoid that one. I meant this design. Looks particularly inviting to cars. Ah, good point. I wonder if another DO NOT ENTER sign on the left would make it clearer to drivers? I remember PBOT saying they expected driver non-compliance to be the same rate as the temporary design, so we will have to see how things pan out and if additional measures need to be taken. Don’t those fixed signposts on the concrete pads create a barrier for fire trucks? Or does the fire truck just weave into the oncoming lane? For those playing the “but emergency vehicles” drinking game, take a sip. Driving around the block, while unfortunate, is a totally legitimate way to navigate past the diverter. Unfortunately. Do we really need that exit off Powell to 17th Northbound? I would love to just see that closed. Neighborhood residents could get almost equal access to their homes by turning right on 21st, and it would truly end the cut-through behavior on 17th. Agreed, that ramp needs to be closed. IIRC, the original proposal form the city for Clinton Street called for ODOT to at least remove the highway-style exit sign, but ODOT never followed through on it. They might as well just close it now and make it a dead-end street where it turns north. We would need that ROW for a future MAX line on Powell, anyway. Actually, we wouldn’t. You have to get past the rail line somehow, and you won’t do that at grade. The supports for the flyover need to go somewhere, and the most direct route would be to diverge from the Orange line east of the Clinton stop but before it crosses Powell to make the turn east. It would eventually run down the center of Powell, but the frontage road would be a logical place to run before crossing to the middle. Going over will be very expensive because there are some pretty high vertical clearances required to cross the rail line, which will in turn require fairly long ramps. We’d need one on each side of Powell. I’m pretty confident it isn’t going to happen. No, we don’t. At the very least, I wish ODOT would remove the sign on Powell that directs people to go that way. My understanding is that PBOT has requested that, and ODOT has declined. Closing 17th would not, however, fix the problem. There is a lot of traffic filtering through the neighborhood from at least 26th, attempting to bypass the congestion on Powell. Removing a sign? Sounds like an easy fix for some community-minded activists. Indeed. All that’s really needed is a big wrench, and a penchant for mayhem. Not that I’ve scoped it out or anything. Isn’t that the whole premise for the movie Cool Hand Luke? Luke goes around chopping parking meters off while drunk. I thought he was a notorious hard boiled egg thief. Sounds like vandalism to me. We taxpayers pay for those signs. I’d be happy to report you if I witnessed this. We taxpayers pay for everything ODOT does (cheap out on Hwy 101 shoulder so people biking fall over, misspend hundreds of millions on the Eddyville boondoggle, publish paternalistic guides to biking reminding us not to *wreck ourselves*, etc.) I’m not really following your point. There is so much of our taxpayer money that is not spent well; do you automatically stand behind all of it? I hope you also report speeding drivers. Traffic carnage costs our country billions of dollars every year. You pay with taxes, higher health insurance premiums, and car insurance premiums. Yes, unfortunately, that would be collateral damage from doing this. I can’t think of any other way, though, to protect Clinton between 16th and 12th from the bazillions of cut-through drivers trying to get to points north and west. Well, more diverters, but I have heard that local residents between 17th and 12th don’t want to feel cut off the from the world by a wall of diverters. I mean, personally, I think extending the Maginot Line of diverters to 14th so it’s impossible to cut through onto Clinton would be the best solution from a policy standpoint. But I can see why people who live between 14th and 12th between Clinton and Division and get around mainly by car would be annoyed by that enough to organize in force. A real gas tax. A steady ramp up to $10/gal at the pump; jump it $0.50/yr until we’re there. It would solve all these problems. A carbon tax would achieve the same thing, but solve more problems. If you’re already thinking of impossible goals, you might as well go for gold. I don’t really see the point in arguing over real gas tax vs carbon tax. Either is fine with me, and I only mention the gas tax here because (a) everyone knows what it is, and (b) it is a transportation specific tax and therefore a bit more closely bound up with what we’re talking about here: automobility. So would a user tax on miles traveled regardless of mode. that flavor is expensive to administer, & how would you pick rates for different modes? They don’t go back to Powell — they’re probably heading either to destinations in the neighborhood, or downtown (via Hawthorne Bridge), or points north. Many drove around the diverters? Were they completed before the snow storm last wendesday ? I personally witnessed probably 8 or 10 drivers go through the old diverter myself. The bike bypass is not currently in the gutter, so??? Standard street sweepers are about 10 feet wide, and that much space next to the curb would likely defeat the concept of deterring auto use, or placement of warning/regulatory signs. They could egad, use a broom and a rake to clear that section of the gutter. Our society is full of gadgets that burn fuel, and don’t accomplish much more than the old tools, especially when you factor in the societal cost. Society has brainwashed us into thinking that we need riding lawn mowers, leaf blowers, mulchers, and chainsaws to do yard work. A few good handtools do the trick without burning oil, in a much quieter fashion. it has? I own an electric lawn mower…that’s about it. everything else in my yard is done by hand. You see one guy with a leaf blower and all of society has been brainwashed? I wash dishes by hand just to hurt society’s feelings. Thanks for pointing that out – I assumed it was since I could not see the signage on the other side of the intersection. Come the hour, come the Adam! Thanks for giving us a little xmas content! Ha. My travels only very occasionally take me down this way, but that detail brought it right home for me. I often appreciate your comments. It’s not critical, but is there any chance you could use your last name or another word so that readers know which Oliver is which? Ha. Sure. Thanks though, and I’m also aware that sometimes my comments are considerably less constructive than the general standard around here. How will this prevent micro cars from driving through here? I think a vegetated diverter would have been better. How? Any examples you can point to? How would a vegitated diverter prevented micro-car violations? A Smart fortwo is 5’1″ wide, as an FYI. I don’t know whether that would fit or not. More importantly, I don’t know whether the outlier that both could fit and would break the law matters all that much, in the scheme of reducing (not eliminating) MV traffic. I have seen a smart car go through the diverter at 17th. It was tight but they made it. Yay! The boys and I used the new diverters for the first time today, with much excitement. I’d love to participate in a diverter beautification event in the future! Yea! Great news. Another improvement for Clinton. People are still dying left and right out east and you wonder why people are angry. Thanks for the excellent report on the installation of the permanent diverter. I am happy to see positive results from PBOT. Good news for all! Will those curbs have reflectors on them? For night riding, the signs are obvious, but I’m not sure the width of the islands is obvious. Striping might do it. 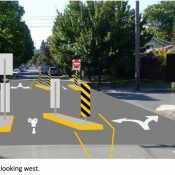 Diverters are wonderful and I believe for the most part effective, would love to hear about plans to standardize design and implement on more of the city’s greenways. My number one complaint, is after going out of my way to use greenway designated routes for safety reasons, finding myself intimidated by aggressive thru drivers. ‘testing diversion’ is part of the process. PBOT is developing the knowledge base for what works internally on a greenway, which has different criteria than at major intersections. Doesn’t feel like it’s happening fast enough. Riding on Lincoln right now (especially during rush hour) still feels like a gamble, and it shouldn’t. If this diverter wasn’t here, the one on 17th didn’t exist, and the bike box/no-turn on Chavez wasn’t there, Clinton on bike/foot/whatever would be an absolute disaster right now. These things absolutely make a huge difference… it’s just the way it is. I wouldn’t call the section from 53rd to 39th “relaxing”, but if that’s the word you’re going for…! I disagree. Yes, it is much better than before the diverters were put in. However, I still encounter aggressive drivers on a nearly daily basis. Friday afternoons, holiday weeks, or any time there is an incident on Division or Powell that exacerbates traffic congestion, Clinton Street is particularly bad. The stretch from 17th to 26th is by far the worst, and still has a lot of aggressive cut-through traffic. IMO, diversion at 26th should have been part of this project – the planned speed bumps will not be good enough to address the ongoing issue. It’s already been established that you report encountering aggressive drivers at a rate far higher than anyone else. Either your definition of “aggressive” differs from other people, or, for some reason, ordinary drivers become aggressive when they interact with you on the roadway. I am not saying there are no aggressive drivers on Clinton, but I would need to hear reports from a few other sources before I felt there was a problem. I ride Clinton only once every other week or so [generally 12th – 36th], but I never don’t have some kind of aggressive run in. Now, it’s not anyone tailing me, threatening me, or yelling at me, but it is the melodramatic rev and speed past me in the opposite lane, *sometimes* when a car or another cyclist is awfully close to coming by in the opposite direction. There’s at least one every time, at a greater frequency than I run into on other greenways I ride more frequently. Such tantrum throwing isn’t a direct form of aggression but it demonstrates a recklessness and sense of entitlement that is especially dangerous on a residential street with children playing, folk walking their dogs, and bicyclists galore. Drivers are supposed to pass you in the opposite lane (though obviously not when there’s an oncoming street user there). There’s no other way to pass while giving you a wide berth. I’d guess that the vast majority of the drivers that do the “pass too closely while revving their engine” move are using Clinton as a cut-through. Most seem to be using the street to get to 26th. The courteous drivers mostly turn off after a block or so of driving behind me. Of the drivers that drive into the oncoming lane to pass me, I’d say the majority come close to a head-on collision with either a driver or a cyclist. I watched vehicles on my street this morning as they accelerated after letting pedestrians cross (or for other reasons), and some vehicles (mostly diesel pickups), were just plain loud when accelerating. Could it be that what you interpret as “revving” is just the sound of a vehicle accelerating to pass? Next time you’re in a car, I’d like you to try an experiment. When there are no cyclists around, try revving your engine while you accelerate. I predict you’ll find it is a tricky thing to do. 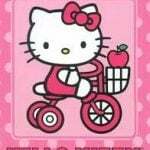 Hello, Kitty – when I wrote “speed,” I meant speed. Not accelerate. 🙂 Accelerate to pass in the opposite lane, while an engine makes a noise, is one thing. Speeding – a sudden and gratuitous and unnecessary burst of speed – to pass, in the opposite lane, when folk coming the opposite way [car or bike] are awfully close for comfort, is something very different, and is what I wrote about above. I don’t want to dissect your experience; I’m only suggesting that what you interpret as aggression might not be the intended by the driver. Perhaps you feel drivers should not be permitted to pass a cyclist on Clinton? I know exactly what Katherine Rose is talking about, and have written about it here in the comments in the past. I’ve been biking on streets and roads for thirty five years. I have no trouble distinguishing between the sound of someone who is merely passing and of someone who is making a gratuitous (auditory) show of his motorized prowess by accelerating demonstratively past me. First of all, I believe I know what Katherine is talking about, as I’ve experienced it, too (on different streets). However, I know what you’re saying regarding what I’ve come to think of as “passive revving”. I used to attribute aggression to drivers who would seemingly stomp on the gas to get around me, because it sure sounded like “revving”. But I’ve come to realize that the sound of revving can mean many things; at least two of them positive: a) a driver who has to accelerate to pass is a driver who has previously slowed down (presumably to wait for a safe passing opportunity), and b) I’d rather have a driver pass me quickly and return to their lane than slowly parallel me as they gradually ease past with no abrupt acceleration. Choice of vehicle/route notwithstanding, I try to keep these things in mind before I fall into my old way of automatically accusing accelerating drivers of “revving”. Again, in a residential area, overtaking needs to be carefully done, and I intend to subtract nothing from Katherine’s or Adam’s experiences—even drivers who don’t “aggressively” accelerate can still demonstrate aggression by tailgating, passing too closely, “passing” (really shoaling) when you are within 25 feet of a STOP, etc. Personally, I would love to see a “cars may not pass” policy implemented on green ways – one with teeth, i.e. Automated enforcement. It is probably a pipe dream, but it is the only way I can see to make greenways be truly, reliably, comfortable for all physically-able Portlanders to ride on. Although it will be fun too, part of me dreads the years when I will ride the greenways at rush hour with my young daughters. Every car I hear behind us will make me think, “Will this be the time when a driver’s impatience and my daughter’s inexperience and/or bad judgment combine tragically?” I already tense up whenever I hear a car behind me on a greenway, even if I am not carrying kids on my bike. You never know what some joker is gonna do. When driving, I already have literally every other street in the city to go 20+ miles per hour on. Is it so crazy to dream of a Portland where when driving on greenways for a few blocks, I am required to go 5mph if that’s what it takes to present zero danger to the 5-year-old ahead of me on a bike? Note: I understand that car passing is currently allowed and deemed acceptable on greenways by the powers that be and our culture at large. I’m just dreaming of what I deem to be a better world here. Agreed, I despise being passed on the greenways. Drivers always swerve around too fast because most of the time they are trying to avoid head-on traffic. It doesn’t feel like a safe situation. Ideally, cyclists would set the pace for drivers, not the other way around. Yep, this exactly. Call them “micro-aggressions” if you will — eventually they wear you down and get to you. You often have to rev a car to go faster. Perhaps it is just your interpretation of that noise? Just to clarify, I’m retired, so I am not out on Clinton during either the morning or afternoon commute times, I am typically out between 10:00AM and 3:00PM. However, I do encounter aggressive thru drivers on other green ways (specifically the 53rd greenway) during those hours. Portland’s greenways function well outside of peak hour. But they fail during periods of heavy congestion, which as someone who works a typical 9-5 job, I get to experience every day. “Society” has “brainwashed us”? We are society, aren’t we? We could also get rid of washing machines and return to washboards. Or dispense with electric drills and use a hand drill. Or even stop using internet forums and just have conversations. Some labor saving devices are certainly not necessary and wasteful, but if you are trying to move a large quantity of leaves, an electric blower is a lot easier on the arms and back. I don’t know many folks who have chain saws, and those that do use them to manage serious growth on their land. Riding mowers? Depends, are we talking about someone living on acres of land or a 50 x 100? Haven’t seen a lot of riding mowers in the city proper, but in the countryside, a hand tool to cut a few acres of lawn? You are welcome to use a scythe. Comment about ‘beautification’. When you build non-standard shapes (planters, etc. ), what ends up happening is a gradual accumulation of debris. It requires hand-cleaning with a broom or hose, to properly clean around weird shapes, something the City does not have the staff or time for. Over here in Bend, I have seen 3 or 4 year’s of accumulation of debris, sometimes inches deep, a foot wide, and very unsightly. Great. Now lets make them less ugly! Some of those round concrete planters from the old bus mall would work. Maybe part of the plan is that “first responders” can drive over this thing in the event of a major incident? I know that is the case elsewhere. It doesn’t look like it’s diverting much of anything, and is completely reliant on the honor system to function. The entire roadway system operation relies on people obeying the rules. All laws are only as good as the people the laws restrict. Well in that case, let’s just have no diverters at all. Problem solved!! The whole point of an *engineering* fix, is to engineer people’s behaviors!